Bacuras as they appear in the arcade version of Xevious. Bacuras (バキュラ Bacura) are enemies from the game Xevious. 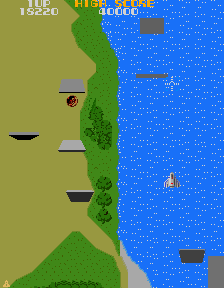 Bacuras are rectangular spinning enemies that appear in the Xevious series, where they would act as an obstacle that the player must avoid, as they could not be damaged by normal means. Bacuras have also appeared in other games developed by Namco as special easter egg enemies, similar to their appearance in Smash Run. A pair of Bacuras in Smash Run. Bacuras appear as enemies. They are invincible obstacles which appear in groups. Touching one deals 4% damage and inflicts a meteor smash. They also can reflect projectiles sent at them. These panels are enemies from the arcade game Xevious. In this game, multiple panels will appear on-screen at once, dropping down on fighters from above and passing through the terrain. Like in Xevious, they can't be defeated, so all that's left to do is dodge around them or get out of there in a hurry! These panels are enemies from the arcade game Xevious. In this game, a few of them will appear on screen at once, dropping down on fighters from above and going straight through the terrain. Like in Xevious, they can't be defeated, so all you can do is dodge around them or get out of there! A rare glitch can happen where if a group of Bacura spawn right before entering a Challenge Door, they will try to spawn inside the Challenge Room. Since they are not supposed to appear in Challenge Rooms, the game will simply crash. This page was last edited on February 16, 2019, at 18:27.